FXArena is a broker proposing a new approach to the currency trading. The company provides traders with online trading service based on various campaigns and contests. FXArena is a forex company corresponding to all current standards. Thanks to the company, traders have an opportunity to develop their skills as well as earn money using new methods. 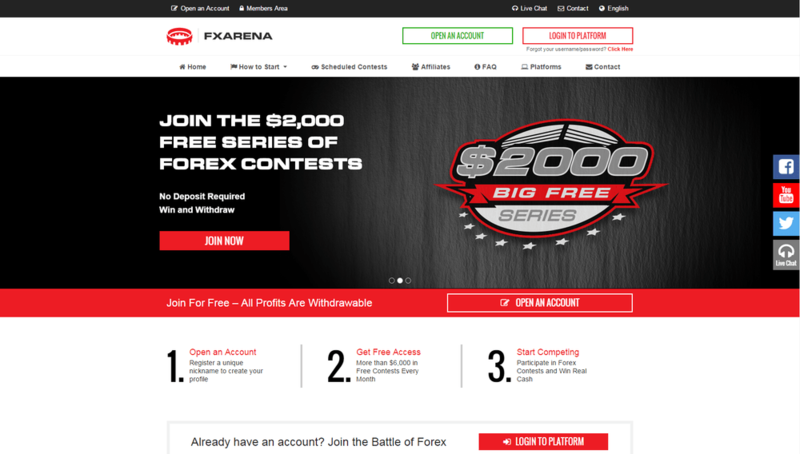 Trading account registered with FXArena gives an access to a whole myriad of contests at any time. Moreover, traders can take part in several contests simultaneously. The company gives a possibility of taking part in free or fee-paying contests. The participation fee is withdrawn from accounts as soon as traders register as participants. Trading is performed via MetaTrader4 trading platform, which enables market participants to choose trading instruments and install the needed expert advisor. The company has gained trust of a lot of traders for only three years. Now, you also have a chance to evaluate the company’s services. 6 months trade with this broker and I am satisfied with their service. Fast execution and fast withdrawal. Spread and commission are very low, I'm more profitable specially scalping in Asian session. I've made the decision to look for another broker better. When I joined this broker, I often confused with a system that is already given. when I am confused, I immediately asked the customer support to understand better the system that has been given to traders. Customer support just say that I should read the website to make it clear and I could understand the systems that are already granted. Show that they are not professional. They should be able to answer all my questions with good. Impossible to access my trading platform now, I sent an email to them to escalate the issue but I haven't got any notification for receiving my letter. It's a good broker but it can be better, especially in customer service, they need to reply emails faster. Spreads are acceptable, but platform sometimes is unstable, especially in the release of economic news. I trade with FXArena for a long time and up to now, i haven't faced any type of issue. Its websites provides me all information i need for a successful trading. They cancelled some of my profitable deals, but that’s the kind of thing you actually expect an offshore broker to do. But their customer support tried really hard to make up with good attitude and politeness. I never double-risk my money, when I was once scammed. I am impressed by this broker! Staff are very polite and very fast to respond in my inquiries. I strongly recommend this broker for everyone! I couldn't focus on my trading plan because the platform is not stable. Good broker, I got a pretty response from them. The reply was too detailed where I can no longer ask question. Let's see how their withdrawal works. I requested a withdrawal of my earning totaled 158USD. It's been one hour past and got no withdrawal confirmation.